Welcome to the Nissan Certified Collision Repair Network! 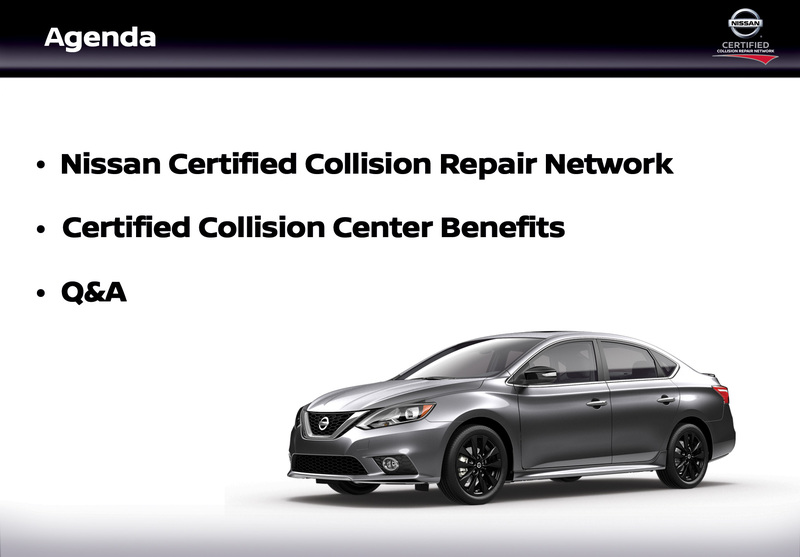 Learn more about the network, benefits you’ll receive as a Nissan Certified Collision Center, Nissan’s marketing efforts to promote a validated repair process, and requirements to complete the certification process. For questions, please contact us at NNACollisionRepairNetwork@nissan-usa.com. 1Discount off MSRP for eligible popular parts only. MSRP excludes all applicable taxes. Participating Dealer sets actual price. Exclusions apply. Subject to part availability. Dealers not required to support all tools. Contact your Dealers for available parts ordering options that best meet your needs. Value Advantage® remanufactured engines and transmissions are not included in eligible part categories and are not eligible for discount. 2Identifix Repair Hotline hours are Monday-Friday, 7am-7pm CST. 3Estimated profit based on increasing number of brake jobs per day. 4Nissan North America provides a limited warranty on Genuine Nissan and Nissan Value Advantage® parts distributed by it and properly installed on Nissan vehicles. The Limited Warranty covers repairs needed to correct defects in materials or workmanship for 12 months or 12,000 miles from the date of installation, whichever occurs first. See Warranty Information Booklet for complete terms, conditions and exclusions. Nissan, the Nissan Brand Symbol, “Innovation that excites” tagline and Nissan model names are Nissan trademarks. ©2017 Nissan North America, Inc.